Homemade avocado face masks can be a fun way to improve your skincare in a creative and inexpensive way. Skincare is an important component of a healthy lifestyle. We only get one chance with our skin, which means we should be careful to treat it right. Face masks are a way to give your skin a boost of radiance while also incorporating the activity into your next social gathering of ladies. Avocado face masks are the most popular type of mask found in the kitchen due to their mostly natural ingredients that can almost all be found in a grocery store. Many women have yet to think of their homes as a beauty salon; however, many already have the resources they need to make an effective skincare treat. If you can hunt down a mixing bowl and a spoon, you are more than halfway ready to get beautiful! To make a homemade avocado face mask, it is important to use a recipe appropriate for your skin type. Since a homemade treatment will be free of any artificial preservatives or pollutants, the majority of skin types will not be irritated by an avocado option. However this fruit is used primarily to help out dry skin looking for hydration and a healthy glow. Mix all of the ingredients in a blender until well blended. Alternately, you may pour them into a bowl and combine by hand. If the end result is too thick, add some extra orange juice. After you follow these steps, you will already be ready to apply your creation. Use your hands or a new makeup sponge to apply the mixture onto your face and neck. Fingers are recommended so you are able to gently massage the avocado onto your skin without penetrating too deeply and risking more damage than good. Leave the mask on for at least half an hour. Rinse off the ingredients with warm water. Using a washcloth or soft loofah to remove the mask will help exfoliate your skin and reveal a new layer of beauty from beneath. If your skin tends to become irritated even with homemade concoctions, using a more concentrated amount of honey can help to ease your skin care woes. Warm a small pot of honey on a stove range, checking the temperature frequently to ensure it is not too hot. While it is still warm, apply the honey onto your face. You can use this underneath the avocado mask, on top of it, or skip the avocado altogether. Just like the above mentioned instructions, you can rinse the honey mask off with warm water. Follow with cooler water to seal your pores and lock in essential moisture. Adding egg white and lemon juice can help bring oily skin under control. Mix these two items together with half an avocado and you should be left with a smooth, creamy texture. Apply this to the face and neck as usual and then allow it to set on the skin for about 20 minutes. Remove with a wash cloth and finish up with a chilled astringent or cold water. When you are looking for the perfect ingredients for your homemade avocado face mask, it is vital you understand what type of avocado you should be looking for. You will want to go for those considered to be fully ripe. If you purchase several at once, allow them to lead a peaceful existence in your kitchen table fruit bowl, or wrap them in foil and store them. Avocados should never go in the freezer, due to their delicate composition. You can determine the ripeness and readiness of an avocado by gently squeezing one in the palm of your hand. The fruit should easily split open and the innards should be soft and easily mashable. 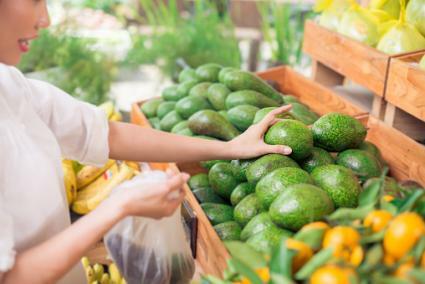 Avocados have long been in hot pursuit by dermatologists and spa experts, as they contain a bountiful supply of nutrients considered beneficial to the complexion. These include Vitamins A & C, potassium, protein, iron, and natural emollients. While many women are spending small fortunes on their facial products, the true secret to beautiful skin is found right in your personal kitchen cupboard. Gather up some friends and have a ladies' night full of junk food, movie rentals, and a rejuvenating skin treatment which is sure to leave you feeling healthier and more vibrant than before.